At the Wolfson Law Firm in Miami, the Miami car accident lawyers represent the good folks of South Florida who have been injured due to the negligence of others. In a fair amount of Miami car accidents, improper lane changes result in sideswipe car wrecks. The failure of one driver to yield the right-of-way can lead to serious injuries and unfortunately, fatalities. If you or a loved one were injured in a lane change or sideswipe car crash in Miami, you should call the Wolfson Law Firm. Our Miami injury lawyers have represented people involved in all kinds of car accidents since 1963. Our attorneys have more than 60 years of collective experience in helping clients get the justice and compensation they deserve. If you call us at (305) 285-1115, we can offer you a free, confidential and bilingual consultation so that you can get the answers you need. ¬ Avoiding Head-On Collisions – If an oncoming vehicle drifts into oncoming traffic and tries to correct too late, both drivers might take evasive action and end up in a an oncoming sideswipe collision. Depending on the speed of the cars, the secondary impacts with other cars or stationary objects can be significant. ¬ Pedestrians – In some Miami car accidents, pedestrians are to blame. Joggers, bicyclists or people just walking sometimes step in front of oncoming traffic. Especially if they have headphones on. If a person steps into a crosswalk, the driver has a split second to make a decision. Do they hit the pedestrian or do they suddenly swerve into the next lane? Is there enough time and space to hit the brakes? ¬ Right Turns – Our Miami car accident lawyers have seen crashes that were caused by drivers making right turns on red after failing to come to complete stop. Other car wrecks are caused by the oncoming driver changing lanes over the solid lines as they approach an intersection. Those solid lines before an intersection are there for a reason. Drivers are not supposed to change lanes as they approach an intersection. The right turning driver may look and see the lane as clear only to be hit or sideswiped by an driver who illegally changed lanes immediately before or inside of the intersection. The right turn driver will likely get the ticket for failure to yield the right-of-way even though the facts may show they were not at fault. If you were injured in a Miami car crash while making a right turn, you should call a Miami car accident lawyer to protect your interests. ¬ Improper Merging – We have all seen it. The driver who enters the highway and simply merges without ever looking, yielding or braking. No turn signals. They drive as if everyone should and will avoid them. They act is if there is a protective force field over them or they simply have no clue. Those drivers are the reason why we are all taught to drive defensively and anticipate other driver’s actions and reactions. ¬ Failure to Yield – Most sideswipe, lane change and merging car accidents in Miami happen because of a failure to yield. Oncoming traffic generally has the right-of-way. Drivers that try to enter the traffic from side streets, driveways or parking lots must yield the right-of-way. 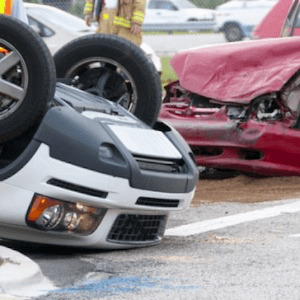 If you were hurt in a car accident in Miami involving a lane change, improper merging or sideswipe you should call our Miami car accident lawyers. Our injury attorneys in Miami will immediately investigate the facts of your car crash. We will get the accident report and when necessary, hire accident reconstruction experts to inspect the vehicles involved and visit the scene of the crash. In lane change, sideswipe and merging car accidents in Miami, experts are often required to make a compelling case on your behalf. The Wolfson Law Firm pays all the expenses of the investigation up front. Our Miami car accident lawyers only get paid if you recover. No recovery, no fee. We are always available to past, present and future clients to advise what you should know about Miami car accidents. If you have questions about your car crash, call us at (305) 285-1115 and we will provide you with the answers you should have to make the right decision for you and your family.